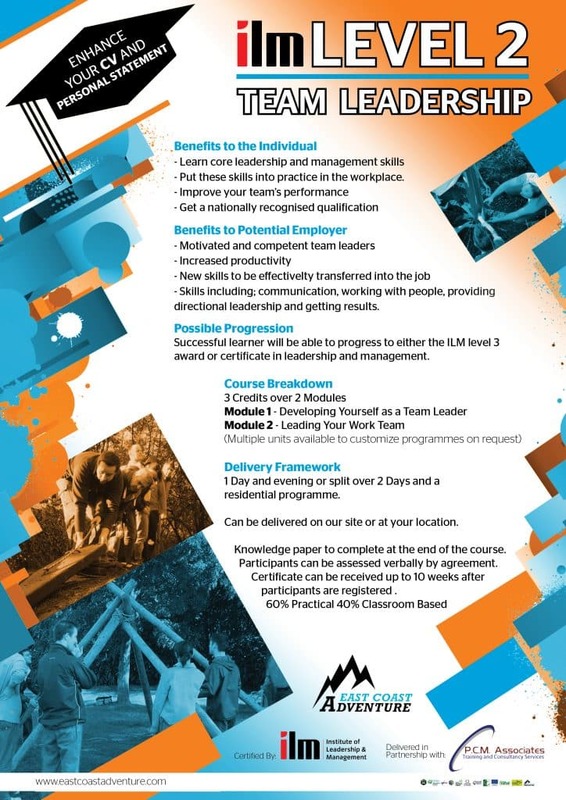 In partnership with P.C.M Associates East Coast Adventure Centre are now delivering a certified Institute of Leadership and Management (ILM) course, Level 2 Qualifications in Leadership and Team Skills. ILM qualifications combine innovative design with a strong focus on performance. Leaders, students and managers will develop the right blend of skills, knowledge and awareness to make a real and lasting difference. The units in this qualification cover a wide range of skills, knowledge and understanding. Knowledge paper to complete at the end of the course. Participants can be assessed verbally by agreement. Certificate can be received up to 10 weeks after participants are registered. This course can be delivered onsite at your location over one day and evening, or split over two days or on a residential programme. Level 2 Award in Leadership and Team Skills. Once the course is completed, students will receive certificate 10 weeks after completion. The Award or Certificate in Leadership and Team Skills is ideal for practicing team leaders, helping them become more effective and confident in their role. They also support new or aspiring team leaders – helping them make the transition from working in a team to leading a team.